WWhen Concept to Reality (C2R) was launched in 2002, our mission was simple: to focus on cutting-edge design development, innovative product strategies, process automation, and “outside-thebox” globally competitive business solutions. 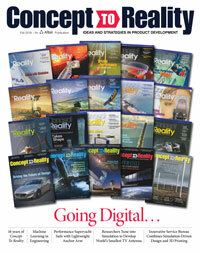 Over the years, Altair’s award-winning print magazine has done just that. 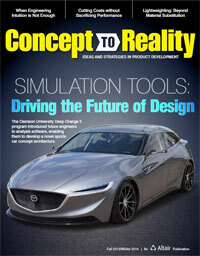 C2R content has offered management insights into how leading-edge companies have pursued creative concepts and robust experimentation of ideas, while leveraging virtual and physical prototyping coupled with optimization and automation. The combination has enabled these companies to transform and differentiate their product development processes. We invite you to take a journey through time to discover how a range of companies across multiple industries capitalized on technology to solve tough engineering challenges while improving their operations and bottom line. Groupe Finot, a French company in the business of building boats, including those that compete in “extreme” races, graced our first cover. The company’s 60-ft sailboat, named Fila, had recently won the “Around Alone” solo race, piloted to victory by renowned Italian sailor Giovanni Soldini. With an eye toward future races, he invited Altair to optimize the design of Fila’s hydraulic canting keel. The original keel structure was made of extra-high-strength steel. Altair collaborated with steel manufacturers to increase the use of extra-high-strength and ultra-high strength steels in the new keel. The goal was to optimize the internal structure of the keel, so engineers went to work on reducing the keel’s weight, lowering its center of gravity and attaining maximum rigidity. They evaluated hull fl ow resistance and analyzed the structural loads and stresses on the keel with Altair’s optimization software. Their efforts resulted in a redesigned keel that was 100 kg lighter than the original design. 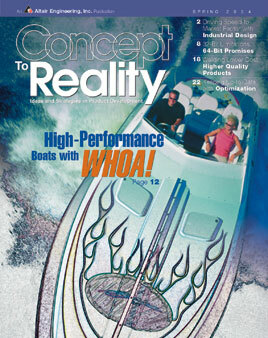 Groupe Finot was not the only boat manufacturer early to adopt optimization technology. The R&D arm of performance boat manufacturer Baja Marine – charged with delivering safe, fast, aesthetically pleasing boats with a comfortable ride – put Altair HyperMesh™ and Altair OptiStruct™ topology optimization software to the test in a new project. 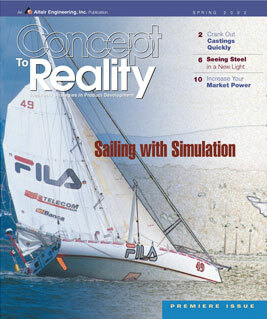 Engineers created a virtual model of a 21-footer they were replacing and analyzed the load distribution throughout the boat’s structure. They discovered areas of highly concentrated stress in the “stringers,” a structural grid system on the inside of the hull that distributes global and local loads and helps support the cockpit floor and deck. For the new 20 Outlaw boat, Baja engineers developed a liner/ stringer system using finite-element analysis (FEA) to not only reduce and redistribute stress levels over a greater area of the structural system but also to cut weight by 235 lbs and boost top speed by 8 mph. 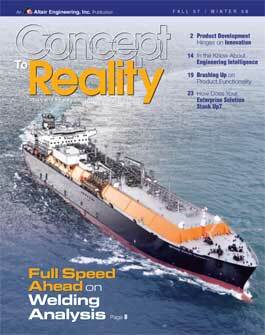 In 2008, Concept To Reality reported on the Shipbuilding & Off shore Division of Samsung Heavy Industries Co. Ltd. (SHI), part of the Korean Samsung Group. The company was proactively pursuing new technology and implemented a computer-aided analysis system that enabled engineers to quickly simulate and minimize welding-induced distortion and shrinkage. Analysis results were used to predict hull panel weld distortion in the design and production planning stages so that the company could make rapid decisions for modifying welding procedures or fabrication methods. SHI and Altair developed a semi-automated analysis setup system that was able to generate and run models in a few hours. The pre-processor enabled the company to quickly control the effects of weld processes and fixturing on the final shape of the welded ship structure. 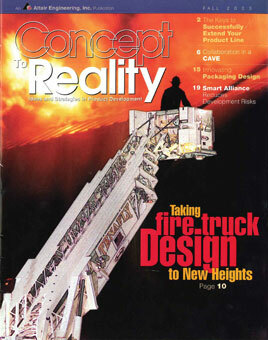 In 2003, Pierce Manufacturing, which builds custom fire equipment, planned to introduce a heavy-duty “tiller” style apparatus with an increased tip-load capacity to its product line. The challenge was to increase the tip-load capacity of the ladder and structural strength of the tiller’s trailer without adding weight. Altair experts worked with Pierce engineers to maximize stiffness and minimize material on the “gooseneck,” the front portion of the trailer connecting the main body to the tractor. Simulation soft ware computed the most efficient load transfer path and identified where material in the gooseneck could be removed. When Pierce built and tested a physical prototype of the fire apparatus, engineers confirmed that the redesigned gooseneck achieved its weight reduction target and met all specifications. In the realm of automobiles, sports car manufacturer Alfa Romeo applied leading-edge analysis tools to develop its 8c Competizione concept car. New double-wishbone front and rear suspensions were critical to building the concept car because they provided the highest level of handling performance; however, double-wishbone suspensions proved less comfortable than other suspension systems. 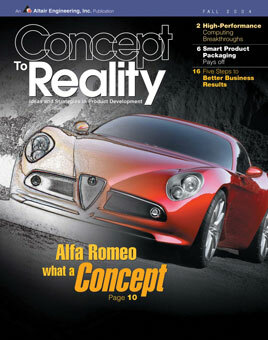 Alfa Romeo and Altair devised a multi-body and structural approach to expediting the project. The team also integrated packaging check capabilities, typically performed in the computer-aided design (CAD) system, using multi-body dynamics analysis and taking component compliances into account. By doing so, they automated the process of importing the component shapes from CAD, assigning their connectivity and identifying any component interferences through the full range of motion of the system. 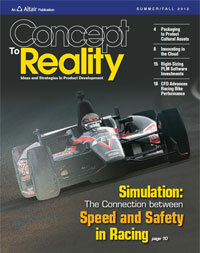 2012 was the year that Italian chassis manufacturer Dallara Automobili S.p.A. relayed how simulation and optimization software enabled the company to develop fast and safe race cars. Dallara was awarded a contract to supply IndyCar race teams with the “survivor cell,” a core rolling chassis called the IndyCar Safety Cell. The Altair HyperWorks™ suite enabled users to conduct trade-off studies, find optimal structural layout configurations, choose materials and improve vehicle safety. The Altair Radioss™ nonlinear and linear solver was used in analyzing dynamic loading in crash and impact studies. Government agencies and companies focused on designing space vehicles and aircraft are often leaders in adopting state-of-the-art technology to address their engineering challenges. 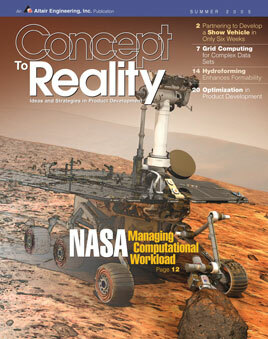 That was the case with the NASA Ames Research Center, whose staff tackle “grand challenge” science. In 2005, engineers and scientists utilizing the NASA Advanced Supercomputing facility welcomed a new supercomputer system named Columbia, to honor the crew of the Space Shuttle Columbia lost in 2003. The supercomputer was designed to enable scientists to conduct research and analyze complex data much faster than before. Helping to manage these projects was Altair PBS Professional™, a workload management solution for grid computing environments, Linux clusters and distributed servers and workstations. PBS Professional optimized the utilization of computing resources by intelligently scheduling and managing computational workload. 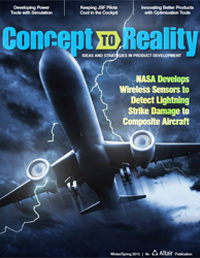 Fast-forward a decade, and researchers in the Lightning and Electromagnetics Effects Mitigation element supported by the Atmospheric Environment Safety Technologies project at the NASA Langley Research Center were applying computational electromagnetic soft ware to develop wireless sensor technology for use in lightning strike protection, damage detection, and damage diagnosis on composite materials used in aircraft. Senior researchers George Szatkowski and Kenneth Dudley applied Altair Feko™, a comprehensive electromagnetic simulation tool in the Altair HyperWorks suite, to validate physical experiments on the “SansEC” sensor. They analyzed the data from physical tests, feeding the new knowledge back into Altair Feko to help determine the direction to take with future physical experiments. The Integrated Defense Systems business unit of The Boeing Company also tapped new simulation technology to refi ne its rotorcraft designs. Weight was a primary design consideration because it aff ected the rotor’s capacity for vertical lift, which also aff ected the aircraft ’s range and ability to fly at safe altitudes. 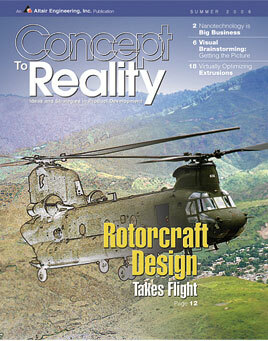 In 2006, Boeing engineers analyzed the ramp of a Chinook CH-47 rotorcraft. The goal of their study was to use topology optimization to accelerate new product development and improve upon legacy design. Using Altair OptiStruct, the engineers produced a radical new open truss structure for the ramp. The design proved to be stiffer than the original while realizing a 17% weight savings. Optimization tools cut the overall development time in half. EADS Military Aircraft, part of EADS, a global leader in aerospace, defense and related services, also knows how CAE tools can impact the aircraft design process. 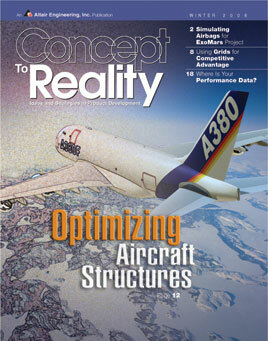 In 2006, engineers used topology optimization methods to develop a conceptual design for leadingedge ribs of the Airbus A380 wing. The innovative rib concepts provided the required load-carrying capacity at the lowest possible weight, resulting in a 40% weight savings compared to classical design concepts. In 2011, Alliant Techsystems Inc. (ATK), a leading supplier of military and commercial aircraft structures, worked on the Launch Abort Motor for NASA’s Orion Multi-Purpose Crew Vehicle. The Launch Abort Motor, able to lift the space crew module off the primary launch vehicle in an emergency on the launch pad, included composite motor case turn-f low nozzle manifold technology to reduce overall launch system weight. The initial design featured a steel manifold. To meet a weight target of 1,300 lbs or less, ATK and Lockheed Martin Space Systems Company agreed to change the manifold material to a high fracture toughness titanium. Thanks to specialized optimization techniques, ATK further reduced the manifold weight by 300 lbs while meeting all strength requirements and deflection limits. RUAG Space, one of the leading European suppliers to the space industry, designs, manufactures and tests structures for satellites and instruments. 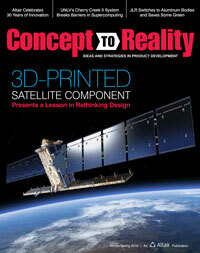 In 2016, the company employed simulation software to build an antenna support for an Earth observation satellite, completely redesigning the support to optimize it for additive manufacturing (AM). Altair simulation soft ware made it possible to exploit AM’s freedom of design by optimizing the topology of the component to use only as much material as was necessary. After the first optimized layout had been created, engineers employed styling and rendering tool Altair Evolve™ to fine-tune the design. They created very complex geometry on top of the output of the topology optimization. The combination enabled users to refine component shapes and tweak designs through structural analysis to meet performance requirements. In the U.S., tournament golf equipment must conform to rules set forth by the United States Golf Association (USGA). One such rule, known as the “coefficient of restitution,” or COR, relates to postcollision velocities. Increasing COR for a given club head will increase a ball’s initial rebound velocity and thus travel. 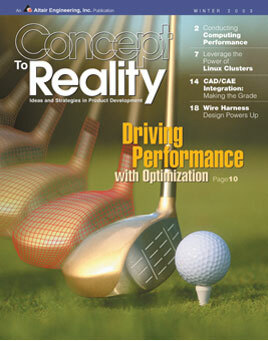 In 2003, researchers at Michigan State University used Altair’s simulation tools to virtually design, optimize, and validate numerous golf head concepts. The team evaluated three shape variables and 10 size variables, obtaining the maximum allowable COR (less than 0.830) while maintaining a club head mass of 200g and keeping club head stress levels below the material yield of 150 ksi. 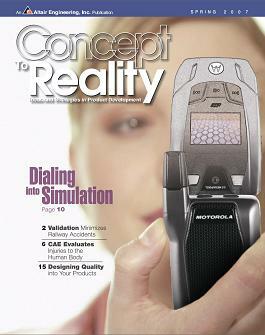 To streamline its cellular phone development process, Motorola leveraged the Altair HyperWorks suite for up-front simulation and prototype testing. Doing so enabled the company to capture product-life behavior, predict areas needing improvements and generate high-quality products in a reduced time frame. For example, engineers performed 40 system level drop simulations before releasing a design for plastic injection molding. 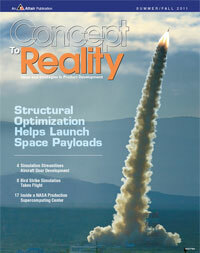 The simulations allowed them to understand the performance of the displays, electrical components, and plastic housings. 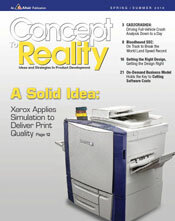 Xerox turned to sophisticated computer simulation to determine the impact of vibrations and disturbances on a business class printer during the ink-jetting process. Collaborating with Altair experts, analysis was performed at the micron level. The team placed accelerometers on the physical prototype of the printer at key points where vibrations might cause problems. Aft er post-processing and reviewing the test results, Altair summarized the load cases into one worst-case scenario for testing 28 different “slam” events. Next, a high-fidelity analytical model was developed to minimize vibration. Natural frequency tests were performed on subassemblies with a tuning fork. Altair built the FEA model and solved for natural frequencies at each step of re-assembly as the printer was physically tested to ensure the highest degree of correlation. Training future engineers to solve complex engineering problems involves arming them with the right tools. The Clemson University Deep Orange 3 program did just that. It harnessed the talents of graduate students in various disciplines to determine vehicle specs and branding for a “Gen Y” concept car. The Altair HyperWorks™ suite helped team members balance design requirements for body-in-white stiffness and strength. Simulation software aided students in evaluating shock tower stresses and torsional stiffness of their concept car. Researchers and students at the University of Stellenbosch in South Africa applied simulation tools to investigate the effects of electromagnetic interference on the design of antennas and radio frequency front-end systems as part of the Square Kilometre Array (SKA) project. The project involves approximately 100 organizations from 20 countries collaborating to construct a collection of instruments designed to improve our understanding of the Universe. 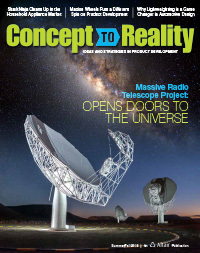 The University of Stellenbosch team conducted physical testing on the MeerKAT telescope, created a 1/20th scale model of the design, and imported the scale version of the antenna from mechanical design software into the Altair Feko™ computational electromagnetics program. They were able to validate the measured and simulated results of the coupling between the radio frequency source and receiver; performed radio frequency interference studies; and made design, layout, shielding, and bonding recommendations to mitigate the interference between the extremely sensitive telescopes. 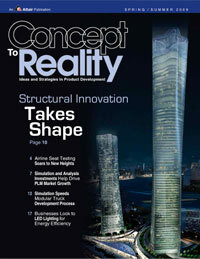 Concept To Reality has also covered the pioneering efforts of engineers who leveraged simulation and optimization tools in structural/civil engineering and energy-related projects. For example, in 2009 Skidmore, Owings & Merrill, LLP, explained how structural optimization enabled the company to evaluate buildings’ behavior and provide an understanding of how forces are transmitted through structures, their elements, and element connections. 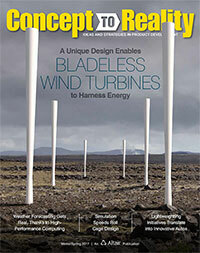 Cascade Engineering, a leader in plastic injection-molded systems, employed simulation tools to verify the design durability of a roof top wind energy system in 2008. Th rough simulation, the company developed a thermal plastic rotor replacement for the carbon fiber rotor blades of a wind turbine. Cascade went straight into production tooling, avoiding time and cost of pre-production tooling. Vortex Bladeless, developer of a wind generator characterized by its lack of blades, collaborated with Altair experts to simulate the aerodynamic behavior of the device. Engineers performed a fluid-structure interaction study with computational fluid dynamics solver Altair AcuSolve™ and multi-disciplinary structural analysis solver Altair OptiStruct. 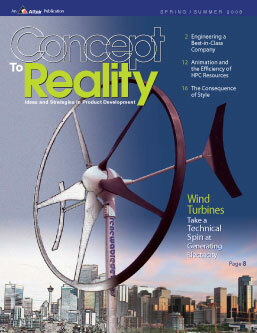 The models enabled engineers to predict the movement of the bladeless structure in different wind intensities. In addition, engineers performed external aerodynamic analysis on the structure with the HyperWorks Virtual Wind Tunnel. As we transition content to a digital format and continue updates on technology and trends, we thank the pioneering companies and organizations, large and small, who harness the power of our simulation tools to accelerate their product and process innovation — and turn concepts into reality. For more information on Altair customer stories, visit www.altair.com.